Lake Maninjau, The Sparkling Beauty Lake Maninjau is surrounded by lush hill which was once the crater lip. Traveling down the hill from the top to the edge of the lake is truly an unforgettable experience. The winding road is sharply down the hillside, while we can see the sparkling water from the height of the hill. Lake Maninjau, The Sparkling Beauty Lake Maninjau, The Sparkling Beauty Lake Maninjau, The Sparkling Beauty No less than 44 sharp bend (called Ampek-ampek flexure) must be passed before reaching the village Maninjau located on the lake. 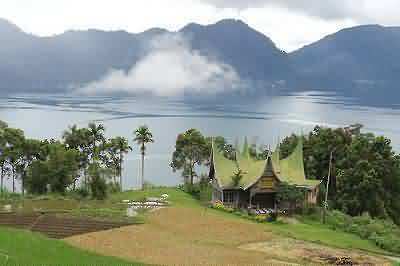 The villages in the area of Lake Maninjau represent the image of the natural Minangkabau villages, here are the hills that surround the lake, natural rice fields and of course the sparkling water of the lake when it touched by sunlight. Maninjau seems to always remind Minang society of their homeland no matter wherever they are.